Islander’s college roommate, Monica C., from Taiwan would sometimes make an easy, refreshing snack to share for their study breaks. Monica’s almond float/tofu reminded Islander of a similar dessert from Hawaii, haupia, a coconut-flavored gelatin pudding. They would take turns making those cute “cultural” cubes to satisfy their sweet tooth at school. Almond float/tofu is found on a few Asian and Chinese restaurant menus. Packet mixes are also available now for home/student cooks. But for our blog post, Islander made it from scratch to show how simple it is to prepare. 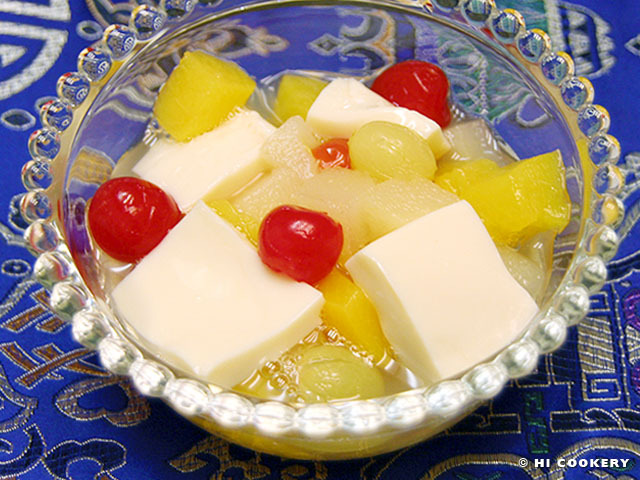 Make an almond float/tofu to eat as study break snack, serve as an Asian-style dessert or celebrate National Almond Day! 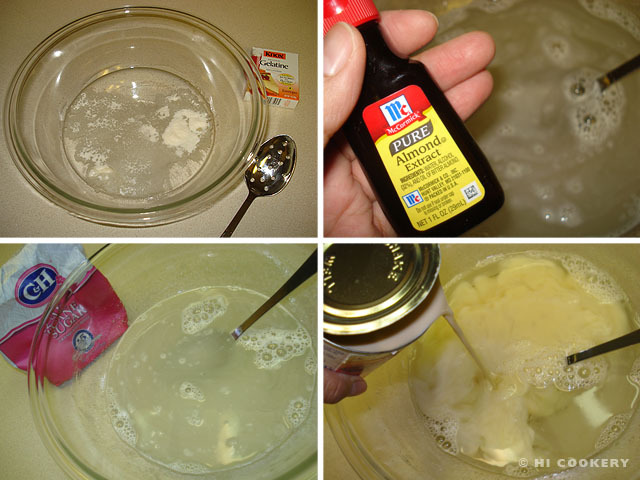 In a large bowl, dissolve the gelatin into the boiling water. Stir to remove any lumps. Add the almond extract. Mix in the sugar. Stir in the milk. Pour into a 10-inch square pan. Refrigerate overnight or until firm. Slice into 1-inch cubes. Gently fold into a bowl of fruit cocktail with its own syrup. Garnish with additional maraschino cherries (optional). Ladle into dessert bowls/cups. Serve chilled. 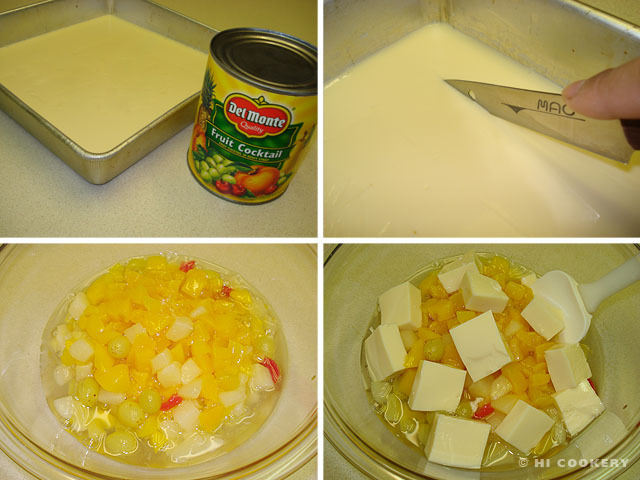 For a white instead of ivory-colored almond float/tofu, substitute regular milk for the evaporated milk. Sprinkle a few slivered or blanched sliced almonds on top of the dessert bowl/cup to add crunch to each serving. Thanks to Sistah Nan N. for the Chinese bag background. She bought it as a gift for Islander from Chinatown in San Francisco, California, where she used to live.